A refreshing summer treat, watermelon is loaded with vitamins and minerals. With only 48 calories per cup, watermelon provides serious nutrition and flavor, without overdoing it on sugar. 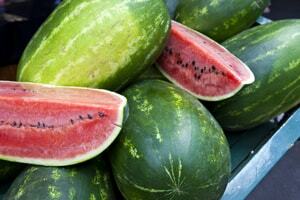 Vitamins A, B and C, as well as potassium and the amino acid citrulline are found in abundance in watermelon.